Countries have followed widely divergent paths of economic development since European colonisation, with some going on to be among the richest countries in the world today, and others having experienced little economic development over the last few centuries. 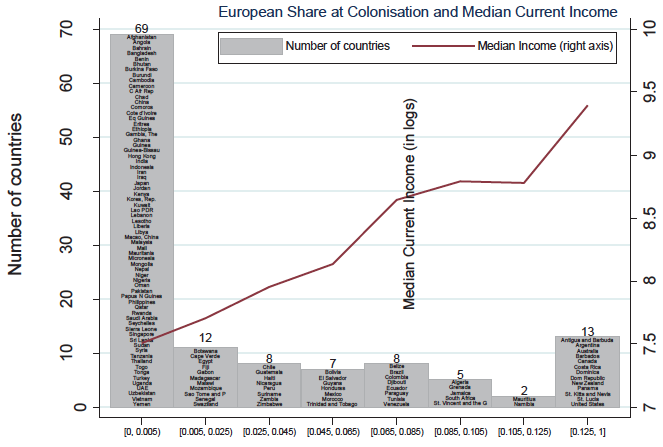 This column, taken from a recent Vox eBook, uses a new database on the European share of the population during colonisation to examine the historical determinants of colonial European settlement and its relationship with current economic development. Countries have followed divergent paths of economic development since European colonisation. Some former colonies, such as the Congo, Guinea-Bissau, Malawi, and Tanzania, have experienced little economic development over the last few centuries, with current per capita GDP levels of about $2 per day. Others, including Australia, Canada, and the US, are among the richest countries in the world today, with per capita GDP levels of about $140 per day. Others fall along the spectrum between these extremes. To explain these divergent paths, many researchers emphasise that the European share of the population during colonisation shaped national rates of economic growth through several mechanisms. For example, Engerman and Sokoloff (1997) and Acemoglu et al. (2001, 2002) stress that European colonisation had enduring effects on political institutions. They argue that when Europeans encountered natural resources with lucrative international markets and did not find the land, climate, and disease environment suitable for large-scale settlement, only a few Europeans settled and created authoritarian political institutions to extract those resources. The institutions created by Europeans in these ‘extractive colonies’ impeded long-run development. But, when Europeans found land, climate, and disease environments that were suitable for smaller-scale agriculture, they settled, forming ‘settler colonies’ with political institutions that fostered development. Other researchers focus less on what Europeans found and more on what Europeans brought. Engerman and Sokoloff (1997) and Glaeser et al. (2004) argue that Europeans brought human capital and human capital creating institutions that shape long-run economic growth. According to this human capital view, European settlers directly and immediately added human capital skills to the colonies and also had long-run effects on human capital accumulation. These long-run effects emerge because human capital disseminates throughout the population over generations and it takes time to create, expand, and improve schools. Furthermore, this human capital view suggests that having a larger share of Europeans during colonisation could facilitate human capital accumulation across the entire population, both because it would increase interactions among people of European and non-European descent and because it might accelerate expanded access to schools. These views yield two testable implications: (1) the proportion of Europeans during colonisation will be positively related to the democratic political institutions and human capital development that yield higher levels of economic development today; and (2) the proportion of Europeans during colonisation will matter more for economic development than the proportion of the population of European descent today because of (a) the enduring effects of political institutions, and (b) the slow dissemination of human capital and creation of well-functioning schools. Although the political institutions and human capital views emphasise different mechanisms, they provide closely aligned predictions about the impact of colonial European settlement on current economic development. Other researchers, either explicitly or implicitly, highlight additional mechanisms through which European migration had positive or negative effects on development. North (1990) argues that the British brought comparatively strong political and legal institutions, which were more conducive to economic development than the institutions brought by other European nations. Spolaore and Wacziarg (2009) stress that the degree to which the genetic heritage of a colonial population was similar to that of the economies at the technological frontier positively affected the diffusion of technology and thus economic development. Putterman and Weil (2010) and Chanda et al. (2014) emphasise that the experiences with statehood and agriculture of the ancestors of people currently living within countries help to explain cross-country differences in economic success. Comin et al. (2011) find that the ancient technologies of the ancestors of today’s populations help predict current levels of per capita income. In all of these papers, the ancestral nature of a population – which was reshaped by European colonisation – helps account for cross-country differences in economic development today. Although this considerable body of research emphasises the effect of European settlement during colonisation on subsequent rates of economic development, what has been missing in the empirical literature is the key intermediating variable: colonial European settlement. While researchers, including Acemoglu et al. (2001, 2002), have examined the European share of the population in 1900, this is well after the colonial period in several countries, including virtually all of the Western Hemisphere. To the best of our knowledge, researchers have not directly measured colonial European settlement and examined its association with current economic development. In a recent paper, we construct a new database on the European share of the population during colonisation and use it to examine the historical determinants of colonial European settlement and the relation between colonial European settlement and current economic development (Easterly and Levine 2016).1 Although we do not isolate the specific mechanisms linking colonial European settlement with current levels of economic development, as emphasised in each of the individual theories discussed above, we do assess the core empirical predictions emerging from the literature on the relationship between European settlement and economic development: namely that (1) the proportion of Europeans during colonisation is positively related to economic development today; and (2) the proportion of Europeans during colonisation is more important, in accounting for cross-country differences in current economic development, than the proportion of the population of European descent today. We first discover that colonial European settlement is strongly, positively associated with economic development today. As illustrated in Figure 1, countries with a higher share of Europeans in the colonial population tend to have higher levels of GDP per capita today. This relationship holds true, after controlling for many features of the areas and peoples colonised by the Europeans, and for which European country colonised the area. Our results also paint a positive picture of the development impact of minority colonial European settlements, about which the previous literature was ambiguous. We also show that the relationship between economic development today and the proportion of Europeans during colonisation weakens markedly when controlling for either current educational attainment or government quality. This finding is consistent with the view that human capital and political institutions are intermediating mechanisms through which European settlement shaped current economic development. Note: This figure shows the number of countries classified in groups according to their European shares at colonisation (left axis). The median current income (in logs) for each group is also reported (right axis). Second, we find that the European share of the population during colonisation is more strongly associated with economic development today than the percentage of the population today that is of European descent. This finding is consistent with the view that Europeans brought growth-promoting characteristics – such as institutions, human capital, technology, connections with international markets, and cultural norms – that had enduring effects on economic development. This result de-emphasises the importance of Europeans per se, and instead emphasises the impact of what Europeans brought to economies during the colonial period. To clarify our contribution, it is crucial to emphasise what we do not do. We do not assess the welfare implications of European colonisation. Europeans often cruelly oppressed, enslaved, murdered, and even committed genocide against, indigenous populations, as well as enslaving captives brought from Africa (see Acemoglu and Robinson 2012 for compelling examples). Thus, GDP per capita today does not measure the welfare effects of European colonisation; it only provides a measure of economic activity today, within a particular geographical area. Although there is no question about European oppression and cruelty during colonisation, there are questions about the net effect of European colonisation on economic development today. We have confirmed the strong association between colonial European settlement and comparative economic development. Indeed, we calculate that 40% of all development that has happened outside Europe is associated with this colonial European settlement. Our findings are a suggestive confirmation of the deep historical roots of today’s development outcomes, as well as the importance of the dissemination of institutions, human capital, and technology across borders. Acemoglu, D, S Johnson and J Robinson (2001), “The Colonial Origins of Comparative Development: An Empirical Investigation”, American Economic Review, 91 (5): 1369-1401. Acemoglu, D, S Johnson and J Robinson (2002), “Reversal of Fortune: Geography and Institutions in the Making of the Modern World Income Distribution”, Quarterly Journal of Economics 117(4): 1231-1294. Acemoglu, D and J Robinson (2012), Why Nations Fail: The Origins of Power, Prosperity, and Poverty, Crown Publishers: New York. Chanda, A, C J Cook and L Putterman (2014), “Persistence of Fortune: Accounting for Population Movements, There Was No Post-Columbian Reversal”, American Economic Journal: Macroeconomics, 6(3): 1-28. Comin, D, W Easterly, and E Gong (2010), “Was the Wealth of Nations Determined in 1000 B.C. ?”, American Economic Journal: Macroeconomics, 2(3): 65–97. Easterly, W and R Levine (2016), “The European origins of economic development”, Journal of Economic Growth 21(3): 225-257. Glaeser, E, R La Porta, F Lopez-de-Silanes and A Shleifer (2004), “Do Institutions Cause Growth?”, Journal of Economic Growth, 9(3): 271-303. North, D (1990), Institutions, Institutional Change, and Economic Performance, UK: Cambridge University Press. Spolaore, E and R Wacziarg (2009), “The Diffusion of Development”, Quarterly Journal of Economics, 124 (2): 469-529. 1 The data and programs used to conduct these analyses are available at: http://link.springer.com/article/10.1007/s10887- 016-9130-y.